In celebration of LYFE's launch on Tokenomy Exchange, stay tuned for a LYFE Trading Contest coming up! Various exciting prizes will be distributed to our winners! :tada: Are you ready? 24 January 2019, 3 PM (GMT +8) to 24 February 2019, 3 PM (GMT +8). 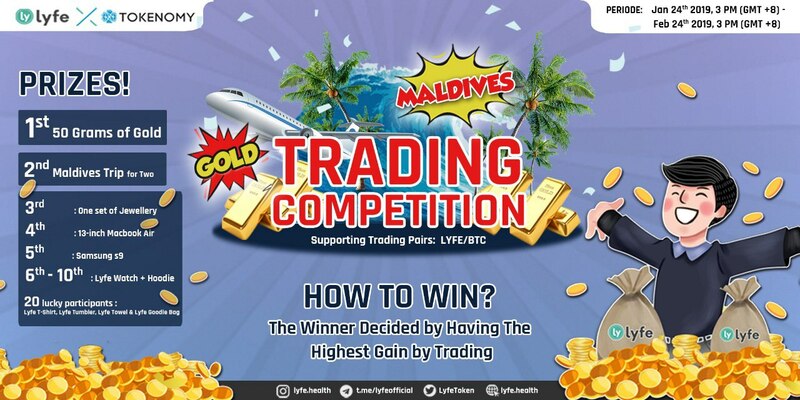 Users will be ranked in terms of the Highest Gain (total amount of Lyfe Tokens Earned) by trading on LYFE/BTC trading pair during the contest period. Note: Initial Balance and Deposit are not included. For example, you have 1000 Lyfe Tokens initially. By the end of the trading contest, you have 2000 Lyfe Tokens in total. Effectively, you have gained 1000 Lyfe Tokens. 4th Place: Apple Macbook Air 13"
Participation Prize: As a thank-you gift to all users who joined during the contest, 20 lucky traders will be randomly chosen to receive our exciting Lyfe merchandise! Look out for our Lyfe T-shirts, Lyfe Tumblr, Lyfe Towels and Lyfe Goodie Bags. Be updated with the results of the Trading Contest! A Live Scoreboard on Tokenomy Exchange will be updated every minutes. 1. In the event that more than 1 trader qualify for the same ranking in the scoreboard, traders will be randomly picked using a computer-generated system to occupy the higher rank. The ranking of the traders not picked will be pushed down one or more places on the scoreboard. - Flight tickets winner must inform the flight date to LYFE Management Team by 31 March 2019. - If flight tickets have been booked, it can not be rescheduled. Start Trading in Tokenomy Exchange today! If you don't already have an existing Tokenomy Exchange Account, head on to Tokenomy Exchange to sign up and start trading LYFE/BTC pair!